CPP introduces its own line of Big Brake kits. The front system uses a 13 cross-drilled, gas slotted and zinc washed rotor, mounted to a 2024 T6 billet aluminum CNC machined anodized hub and a PBR C15 caliper that attaches to the spindle with CPP custom caliper mounting brackets. PBR C15 calipers have twin 52mm pistons and a larger brake pad surface area that offers about 60% more stopping power in the caliper than the popular C5 caliper at half the cost. Big Brake kits requires a 17" diameter disc brake type wheels (easy-to-use wheel template available). The rear kit utilizes a 12" rotor and Lincoln caliper. 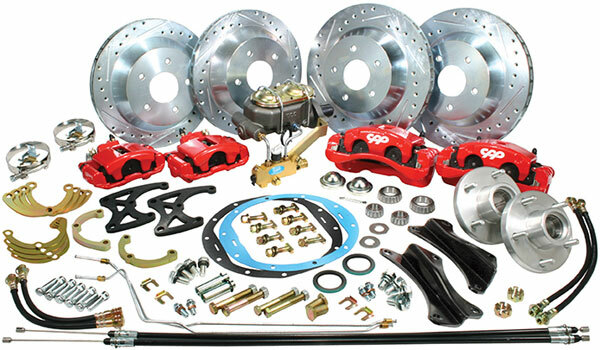 Kits are complete and include front and rear rotors, front and rear loaded calipers, hoses, front bearings and seals, front and rear mounting brackets, forged aluminum hubs, all necessary hardware and include a 4-wheel master cylinder and proportioning valve kit. Note: Kits are all original drum offset. These kits are for original rear end. Inquire for alternate rear end kits. * Shown with upgraded calipers.